Mollies are popular freshwater aquarium fish, available in a variety of types, sizes and colors. For beginning aquarists, mollies are good first fish because of their durability, their active nature and their disease resistance. With their range of diversity, some aquarists opt for keeping a collection of just mollies in their aquarium. While oxygenation is essential for optimum health of aquarium water, some bubbles are a sign of something amiss. Mollies, for example, are excitable eaters who might lead a novice fish keeper into the common but detrimental practice of overfeeding. Uneaten food and the excessive excrement resulting from overfeeding causes an unsanitary detritus buildup that makes tank water unhealthy. Such an abundance of sediment also increases the water's surface tension, creating a bubbly and foamy ceiling. This oxygen-destroying conglomeration is not healthy and needs scooping out or vacuuming. Proper aeration creates tiny bubbles to oxygenate water, providing the healthful environment mollies need to thrive. For a molly aquarium, you'll need two types of bubbles: the bubbles resulting from efficient biological filtration and pump-generated oxygen bubbles. 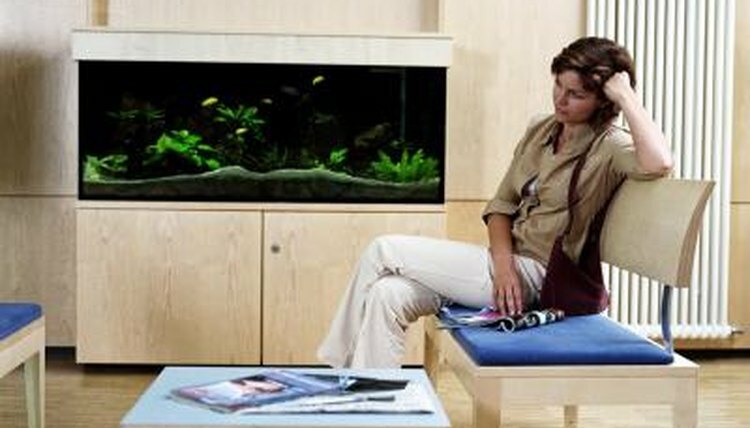 Aquariums utilizing air-driven filters, under-gravel filters or hanging power filters create bubbles. Naturally occurring bubbles from filtration are not enough, so an air pump or air stone is necessary. Pump-generated bubbles aerate your aquarium, providing your mollies with breathable oxygen. These bubbles also help minimize water maintenance by aiding filtration. Bubble-making air stones range in styles from inexpensive silica or sandstone to the more elaborate color-changing LED bubble wand. Somewhere in between lie hydro-bubble makers, bubble discs and anchor bubblers. Mollies need swimming space and a couple of options for oxygen-producing dissolvable bubbles. If your aquarium sustains two or more mollies, you need a tank of at least 30 gallons. Healthy mollies engage in schooling, creating a need for ample swimming space. If you have male and female mollies, they will propagate, necessitating a protected area for their fry. In roughly 60 to 70 days following propagation, you'll have about a dozen additional mollies. This increase of inhabitants calls for the bubble-forming filtration and aeration that occurs with a fully equipped 30 gallon aquarium. In your bubble-manufacturing quest, bear in mind that micro-size oxygen bubbles dissolve faster than larger bubbles because of the higher surface-to-volume ratio. Keeping a single molly in an unequipped fish bowl is a feasible practice, but only under ideal circumstances. Short-finned mollies (Poecilia sphenops), such as the black molly, are a good single molly choice. Since mollies are tropical fish, they require warm temperatures, 68 to 82 degrees Fahrenheit to survive. Spencer Glass, in his book "Mollies: Keeping & Breeding Them in Captivity," claims the lack of sufficient air circulation may shorten the typical three year life span of a molly. Weekly water changes and use of a water conditioner are essential for a molly kept in a bowl. Water conditioners are multipurpose; for a molly in a fish bowl, blackwater conditioners work best. These conditioners replicate a watery environment similar to your molly's natural biotope.